Come and croon together to catchy old tunes usually sung alone in the car or the shower. Swing songs usually feature one vocalist or a small vocal ensemble with tight harmonies. This workshop will break that rule; attendees will sing out loud together. Instrumentalists are welcome to accompany songs, but the emphasis will be on singing. Lyrics will be provided. Swing songs and ukuleles are a great match. 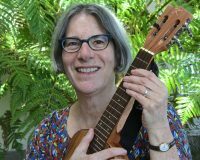 Since taking up ukulele, that fire has fueled Karen’s passion for playing and singing swing. Karen can regale you with stories, songs, and her inimitable comic timing. However, she’s most happy fulfilling her 3rd grade teacher’s observation noted on a very old report card “Karen likes to sing, and lead the class in song.” After all these years, this still rings true.